Each January, while everyone is making new years resolutions, I am reminded of one of my big regrets in life -- that I didn't finish journalism school at USC. Having completed three years, I quit before my senior year, married, had kids and enjoyed life tremendously. But each January, I really, really regret not being a journalist covering the Dakar. The Dakar is a thirty-year old, extreme desert race for cars, trucks, and bikes, a two-week test of endurance that has cost some their lives, others, their health or bike and many, their desire to ever do it again. and I no longer had a paying job covering the Dakar. Dakar 2014 kicks off tomorrow, January 5th and runs through January 18th. For the first time ever, the Route is separated for part of the rally. Five stages will separate the bikes and quads from the cars and trucks thus allowing narrower, more intricate routes for the bikes and a cleaner, faster trail for the cars and trucks to run, sans bike tracks. Also, interesting change for this year is that the motorcycles and quads will have two marathon stages with overnight accommodation part of the stage and in which riders will not have their support crew with them, they will have to rely on other competitors if they need help. Not sure how I feel about that, I don't think I like it. 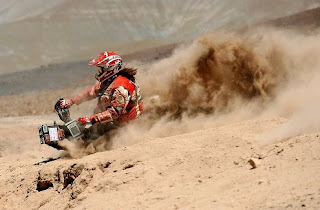 Dakar 2014 will cover three countries: Argentina, Bolivia and Chile with the Start at Rosario and the finish at Valparaiso, two port cities located on opposite sides of the South American continent. The riders will ride along the coast for awhile, then go through the mountains and finish by crossing over to the opposite coast. The temperature and terrain changes are vast and challenging. Dakar 2014 currently consists of 431 competitors, 174 bikes, 40 quads, 147 cars and 70 trucks. Several will drop out. In the motorcycle category, 34 Nationalities are represented, the largest - 15.3% - being French. Followed by Spain, Argentina, Chile, Italy. The U.S. is average, right in the middle, with 2.3%. Silvia Giannetti, having a little trouble here on Stage 5, Jan. 6, who, after Stage 9 and after Mirjam Pol's withdrawal, has acquired the #2 overall standing in the Ladies Cup. Go, girl!